Hello. I am really excited to share today’s video with you! I show a few ways to create “inside shadow box cards”. The cards look normal from the outside but when you open it? A shadow box pops up! This is such fun to create cards with a surprise inside! And these shadow box cards are easy to make. To learn the process and the dimensions used, please watch the video. It is better to see in action then to share in text. For all of most of my cards, I used the new Hero Arts June My Monthly Hero Arts Kit. This is an *amazing* set that will sell out fast! (More on it below.) Such beautiful images. I kept the front of my cards simple since the inside has so much to offer. On this first card, I white heat embossed images from the Hero Arts June My Monthly Hero Arts Stamp Set and used a VersaMarker Pen to draw waves. For my next card, I again kept the outside’s design very simple. The “just a note to say” is from the Hero Arts Hello Stamp & Die Set (HA | SSS). In the inside, I used more of the images from the Hero Arts June My Monthly Hero Arts Stamp Set to create a tropical scene. The islands in the distance? I made those by stamping with the back of the cloud stamps! 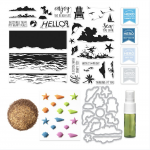 The “hello” is heat embossed with sand embossing powder that is included in the Hero Arts June My Monthly Hero Arts Kit. Oh – and I used a die from the Hero Arts Rectangle Infinity Dies (HA | SSS) to cut the window. And on the inside? I added sentiments and a seagull from the Hero Arts Seas the Day Stamp Set (HA | SSS). So cute! My last card is also an inside shadow box card… but this time it is top folding. On the front, I create a wave element using Hero Arts Wave and Sea Confetti Die (HA | SSS) and a die from the Hero Arts Circle Infinity Dies (HA | SSS). On the inside, I used the Hero Arts Killer Messages Stamp Set (HA | SSS) to create the shark and sentiment. That Hero Arts Wave and Sea Confetti Die (HA | SSS) is great for creating die cut waves! I had SUCH fun making these. I hope you try this shadow box card design! Love this set. Went to purchase one and it was sold out. Very sad. I have written Hero Arts in hope. Fingers Crossed. Would love to win one. Your cards are fabulous! Love this kit, but didn’t get on time. Your work is very inspiring, keep up the work & the great inspiration! I ordered mine already, I can’t wait! Your creations are CAS-worthy, love ’em. This kit makes me want to throw the kids in the card and head to the beach! The layering water stamps 💗💗💗. I have never attempted a shadow box card and now I have to give it a shot! Thank you so much Jennifer McGuire for breaking down card making techniques.!!! Fantastic cards and a great idea for a shadow box! Your cards are fantastic!! Can’t wait to receive my kit!! I ordered the Sea gulls, you can almost hear them saying…mine, mine, mine! Wow, you are so talented. Very nice creations. My happy place is the beach. Such a healing time for me and my family. Would love to send these thoughts of rest to my “beachy friends”. The kit is now out of stock so I hope you pick me!! LOVE LOVE LOVE this kit! And these are some great ideas. Thanks for sharing!! Love this card kit! Wish I would have gotten my hands on it before it sold out. Great tips on shadow box cards, will have to make one. Tahmks for your videos! Wow, I think these cards are my all time favorite of the cards you have made. I do hope Hero Arts will release some of these stamp sets for sale at a later date as they sell out so fast. I seen this set and had to order it immediately, I can’t wait to play around and design some great cards with this set, but I will diffidently be making cards that are inspired by these beautiful cards, thank you Jennifer and Hero Art. I adore this set. It was out of stock before I had a chance to order. Thank you for the Giveaway. I live by the ocean & love anything to do with it. Wish Hero Arts would make 1000 more kits so more people, like me, would have an opportunity to own it. Thanks for the great video showing how you made these cards that make my heart happy. Thanks also for the Giveaway. Oh, how I’d love to win. I am in LOVE with this set! I was born and raised in Hawaii and currently living in Texas. This is a set that takes me back home. Thank you for the post beautiful work! I absolutely love the beach! What a cute card kit! I love watching your videos and all the great styles that you use! You definitely inspire me! What a great idea! The cards look absolutely stunning! And that HA My Monthly Hero June kit looks like fun! What a great technique ad really cool cards! this is so fun! i do adult foster care with elderly ladies and we love making cards. this makes it sooo easy for the ladies and fills their day with fun. Love it ! These are just stunning!! Love the colors you selected. Your creativity is always amazing. Thanks for sharing your tips to recreate these lovely cards. The cards you’ve made with this kit are lovely! Thanks for the chance to win the kit. Great cards as usual. Thanks for all your tips. I have a question, I attempted this technique. Mine did not turn out. Are you putting the double sided tape (on the back) next to the first crease (left) ? The pocket formed on the one side, but I had to rip it open to see the other side. Love the shadow boxes. Actually quite easy if you know how. Thanks for such a fun technique! I have come back several times to look at it again. Today I think I’ll make a few for my grand daughter… Just because they love mail & I think they’ll get a kick out of the way the cards work! Thank you again for your attention to detail and showing the steps clearly in all the cards you make for us!! i would love to win this set! it is sold out and you can’t get the stamps anywhere! love how you did the shadow box cards! I tried to order this, but they are sold out! Wish I could get one. These are really lovely cards. If you don’t see the post right away, you lose out! Oh my goodness, these cards are wonderful! I love these shadow box cards – they look like ones I could actually see myself doing. Thanks so much for sharing these and for continuing to bring amazing art to us all. Thank you also for your clear and easy to follow tutorials. is there a place were I can find written instructions and measurements for the way you made the card? I am new and this is my first post, maybe there is a place to look and I just don’t know where. Jennifer, quick question. Sorry if this is obvious. Why do you cut 1/2 inch off the back flap? Does it make the card open more easily? Thank you, I enjoy your techniques and ideas very much. These are so ingenious!! I love to learn something new every day. Thank you for the video and would love to win the kit! Hi Jennifer. I love your videos. Thank you for sharing your kindness. This might be a dumb question but what kind of paper trimmer did you use? I looked in the supplies and I didn’t see it listed. I live in Canada and hope I to find a trimmer with the numbers at the bottom of the cutter. I would appreciate any help you can give. Thanks and have a great day.